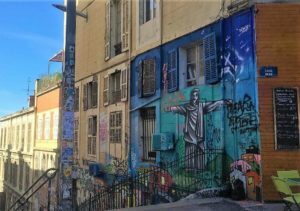 Anchored away in a timeless historical Southern quarter of France, Marseille is a bay of culture, traditional and modern alike. 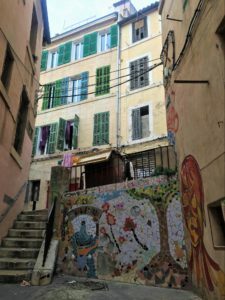 Delve deeper into the canvas of time-hallowed edifices like the Notre-Dame de la Garde or the hub that is Vieux Port, and you shall discover yourself in a realm abstract of colors and hues unimaginable. 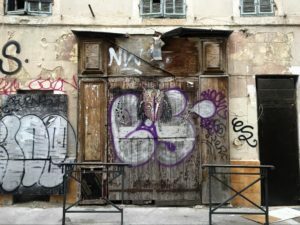 I speak of course of street art, in particular, the street art I discovered during my wanderings in Le Panier and Cours Julien, two hip and trendy neighbourhoods of the port city. 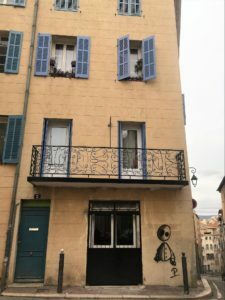 The Le Panier neighbourhood in Marseille is overflowing with creative expressions on each and every available surface of the streets, shops, sidewalks and store shutters. The artsy ambience of this quarter speaks to the passerby in the most unlikely of places. 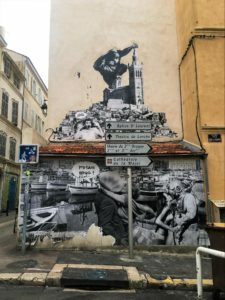 On some occasions, the traditional graffiti gives way to mosaic art, as captured above, adding a unique dimension to the artistic expression screaming from almost every street corner in Le Panier. 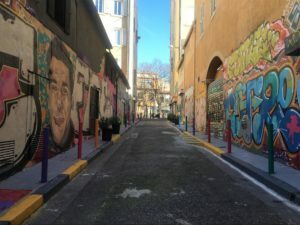 Another thriving arts scene can be found in the Cours Julien, a space owned by its residents in its entirety as they use their very neighborhood as a canvas for mind blowing creative expression. A tiny flavor of Brasilia in this up-and-coming French quarter, as seen on the side-wall of a café serving Brazilian cuisine. What makes Cours Julien a unique artsy haven is its ability to sew street art seamlessly into the fabric of everyday life. When it comes to street art, it’s impossible to divorce oneself from the age-old debate of art versus vandalism. Certainly, in their own regard, each argument holds weight. Walking down the streets of Le Panier or Cours Julien in sheer wonderment, however, I could feel the people live through the medley of hues they covered their walls and doors and buildings with– that, more than anything else, spoke volumes about the significance of what I was experiencing. I step off the bus parked around the corner from the Santa Maria Novella train station, and suddenly a wave of deja-vu washes over me. It’s 3am, pouring rain, and neither of our phones have service. In any other city this would be a perfect time to panic, however Florence is all too familiar to us, so we grab our bags, put our hoods up, and head across the Ponte Vecchio towards our Airbnb, exhausted, but completely at home in the world. The next morning, we head to Piazza Del Duomo. 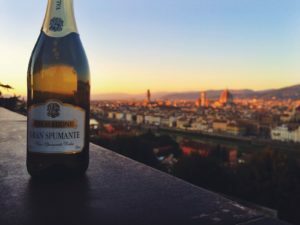 My roommate, Chiara, and I studied abroad in Florence during our freshman year, and decided to go back for the weekend to visit some friends and torture ourselves with a bit of nostalgia. It’s been two years since we’ve been here, and somehow it feels like we never left. We look up and see Il Duomo di Firenze which is both a groundbreaking piece of architecture and perhaps one of the most unbelievably beautiful things on this earth. Every time I see it it takes my breath away. Seeing this massive gothic structure planted in the middle of a piazza, I wonder how it even fits into this quiet little city devoid of even a subway system. 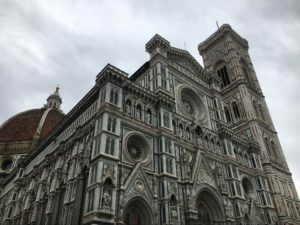 If you’re looking for things to do in Florence for the weekend, it’s free to go inside the cathedral, though there may be a line, but you can also climb the Duomo if you want to see the city from up above. In my opinion, however, a better view of the city can be seen from Piazzale Michelangelo. It’s a much further walk from the city center, but the view, especially at sunrise and sunset, is always worth it. Of course, Florence is notorious for its art history, so during the day, you must go to the Galleria dell’Accademia and see Michelangelo’s masterpiece, the statue of David. 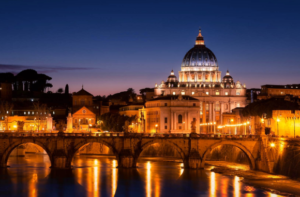 After that, maybe take a stroll through the Uffizi or the Museo di San Marco. 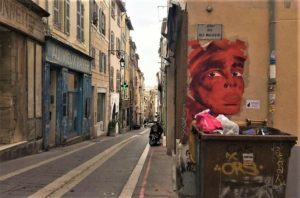 But, if you’re tired of museums and churches and endless gallery hopping, Florence also has some amazing street art. 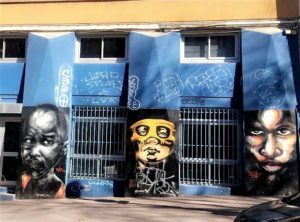 The most well known street artist is probably Clet Abraham whose work can be seen all around the city. 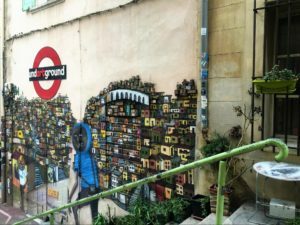 Another hidden gem is the graffiti tunnel in Piazza delle Cure. I came across it one day when I was wandering around the city completely lost. As you go down the stairs into the tunnel, it’s like entering another world. Ristorante Parione: The truffle gnocchi is indescribable, and the owner is so lovely. Last time I was there he gave me a free bottle of prosecco! Trattoria Napoleone:Seriously, if you’re a person who loves truffle anything, you’ve got to try Napoleone. They have an entire menu devoted to truffle infused dishes. I’m talking truffle lobster, truffle salmon, truffle ravioli etc. The list goes on. Trattoria ZàZà: Za-Za is a bit more tourist-y, but regardless the food is absolutely incredible. If you’re on a student budget looking for a cheaper bite that’s just as authentic as the more high end restaurants, this is the place for you. 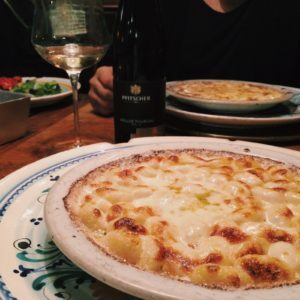 Osteria Santo Spirito:Located in Piazza Santo Spirito, Osteria Santo Spirito is a place my friends and I loved to go to a lot as freshman, (and also has very good truffle gnocchi). If you can, make a reservation and try to sit outside. Order a bottle of red wine, people watch, and just enjoy the atmosphere with some friends. When I think of the year I spent in Florence, I see a kaleidoscope of memories happening all at once. I think of sprinting after the #25 bus that always shows up too early or too late. I think of meeting all my best friends, seeing Botticelli’s Primavera for the first time, and drinking prosecco at sunrise. Now I’m returning as a tourist. 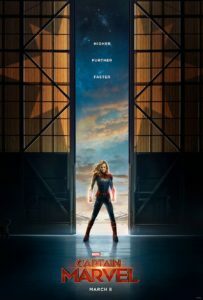 A stranger. And while so much has changed, after moving to New York and then moving to London, the timelessness of Florence is never lost on me. And this beautiful little city full of yellows and golds has somehow stayed exactly as perfect as I left it. Slainté: A word commonly heard throughout the cobblestone streets of Dublin, it translates into the word, cheers! 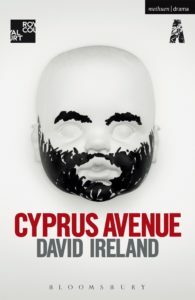 Dublin is a charming city filled with exquisite architecture, cozy neighborhoods and an abundant population of redheads. Inspired by gothic architecture, it’s impossible to walk by and not stare in awe of its grandiose stature and beauty. With the peak of the church that pierces the sky, it’s easy to spot this monument in the city ways away. The interior of the church is strikingly beautiful, adorned with large archways and delicate stained glass windows. I was fortunate enough to briefly hear the church choir: the booming voices filled the church and magnified the ethereal ambience. 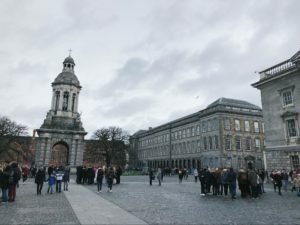 Located in the center of Dublin, Trinity college remains one of the largest tourist attractions in the city (but for good reason!) The campus is a great area to walk around and admire the blend of gothic and modern architecture. Temple Bar is a bustling neighborhood on the riverside of the city, spread out on several cobblestone streets. 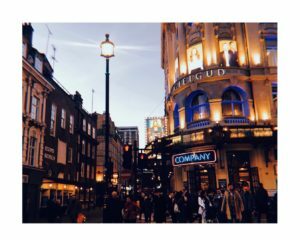 It houses pubs, galleries and restaurants, and is deemed the cultural hub of the city. 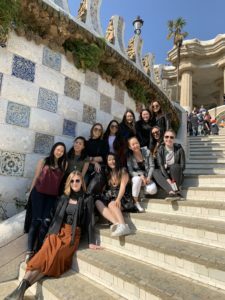 The best time to visit Temple Bar is towards the evening, where nightlife starts to bloom and uni students come out to grab a drink with friends and celebrate the weekend. The birthplace of Guinness, the brewery tells the tale of Ireland’s most famous beer – complete with taste testing, a rooftop bar, and the opportunity to pour your own pint. The interactive walk-through experience invites tourists to learn about the history of Guinness and their unique craftsmanship. 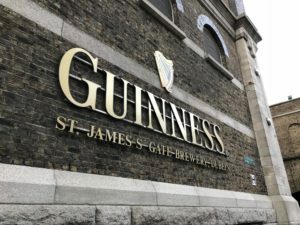 Even if you’re not a fan of dark beer, the engaging experience at the Guinness storehouse is a must see attraction that makes it worth your while. Dating back to 1198, this is Ireland’s oldest pub! A little ways from central Dublin, if there is one pub to eat at and drink while you’re in the city, this is the place to do it. Decorated with green lamplights and classic Irish trademarks, it was a stellar setting to try first hand traditional Irish cuisine. 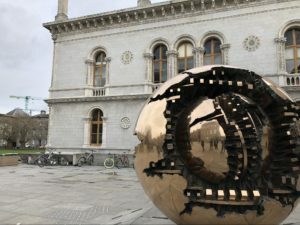 Never having traveled to Ireland before, I was eager to get a glimpse of the Irish culture. 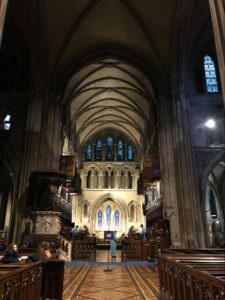 Although I couldn’t see everything that Dublin had to offer, I’d say that what I saw was a more than fulfilling compromise to get a taste of the city.